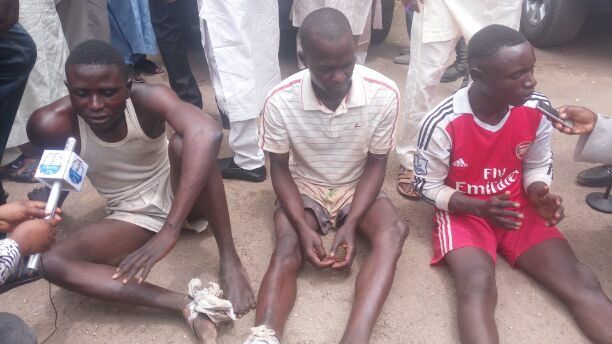 Kaduna Police Command on Monday paraded three young men allegedly involved in the killing of two herders at Anguwan Duka in Jema’a Local Government Area of Kaduna State in spite of peace efforts ongoing in the troubled southern part of the state. The suspects, who have confessed to have killed the herdsmen at Anguwan Duka on Saturday in self defense include; Danjuma B Joseph, 20, John Luka, 22 and Austine Joseph 22 are currently cooling their feet at Police Headquarters Kaduna from where they will be charged to court. “We met them in the bush and asked them to leave. But they refused and drew out swords and were advancing towards my brother who was able to dodge the machete. It was in that process we observed that they did not meant well for us and we attacked back with machete leading to their death’’, Joseph confessed. Parading the suspect before newsmen, Police Commissioner in the State, Agyole Abeh who warned that, his command would not tolerate any act of crime and criminality as anyone found culpable will be prosecuted accordingly, added that the suspects were arrested based on tip off by locals in the area. According to him, “as you must have observed, peace is gradually returning to southern Kaduna. However, some persons are bent on truncating that peace efforts in that area as witnessed few days ago as some of criminal elements in one of the communities in Kafanchan attacked and killed two herdsmen while grazing with their livestock. However based on tip-off from good Samaritan, some suspects were apprehended which paid off as three of the suspects confessed to have taken part in the attack on the herdsmen. “I am committed to ensure that the citizens of Kaduna state enjoy benefit of security and as such, the command will always be on top of the situation not only in southern Kaduna but any part of the state. ‘’Arrest of the suspects who killed the two herdsmen on 11th of March, 2017 at Ungwan Duka is clear indication of my determination to bring to justice anyone or group of persons found to be engaged in an act disrupting the peace of the state and southern Kaduna in particular. The five gunmen paraded in February in connection with Samaru Kataf attack are already in court. “I want to assure the good people of Kaduna State of my resolve and total commitment at ensuring that all forms of crimes and criminality are brought under control so that citizens will be free to carry out their lawful businesses without any form of molestation”.